Alright, here are the tidbits and observations I gleaned from watching Thursday. As with my Winter X notes, this is less a detailed recap and more a supplement to what you can find on EXPN.com. So much went down on Day 1 that I have a little more than 2 pages of notes. There were some unbelievable moments, as well as some nerve-wracking ones. At the end of the night, I had thought I was a jinx since I originally picked Travis Pastrana and Chad Kagy as gold medalists for Moto-X Best Trick and BMX Big Air and both got carted off on a stretcher. Then I remembered that I changed my Big Air prediction at the last minute. It’s still upsetting to see an athlete go down hard. Jed Mildon is officially nuts— not just because he did the triple backflip but because he pedaled down the Mega Ramp roll in. It boggled Kevin Robinson and Dennis McCoy’s minds. I like having pro commentary. You get an insider’s perspective, plus some “back in my day” stories. 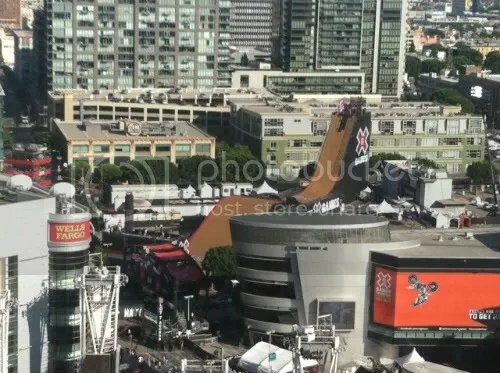 K-Rob shared this picture by Scott Roegner to show you how high the Mega Ramp is. According to K-Rob, a 360 tailwhip is more difficult than a flip. I can see that since you’re multi-tasking. Chad Kagy is riding with a plate and 6 screws in his hand, and he still stomps his tricks (even with a pedal slip). Vince Byron stomped his no-handed 540 so hard that his bike broke. Chad offered him parts for Vince decided to wait it out since the geometry would be off. See, math is important, kids. According to DMC, the old school approach to tricks was “I wonder if this is going to work, let’s find out.” No wonder he’s still nuts (44 and still competing). We learned the importance of doing 2 solid tricks. A double frontflip over the first jump is awesome and all, but you better follow up with something on the quarterpipe (and Anthony Napolitan did at the end). At the last minute, Steve McCann edged out Vince with a double frontflip and a double tailwhip. Chad looked like he injured his right leg pretty badly. Later it was reported that he broke his femur. Most exciting Step-Up comp in years! That’s mainly due to the fact that Tommy Clowers’ 11-year-old record of 35 feet was finally broken. It’s interesting to see everyone on 4-strokes. I remember when riders insisted that 2-strokes were better. I also remember when the step-up bar was held up by two flimsy poles. The guys in the booth also mentioned differences with the ramp and starting position. Matt Buyten wins and breaks the X Games record at 37 feet, and he’s still recovering from a broken wrist! Seeing Ronnie Renner and Buyten’s Twitter exchange just shows how good sportsmen the two “rivals” are. Best Whip showed me that there were many different types of whips. My favorite was Jarryd McNeil with the look back (he appeared a bit inverted). My boyfriend compared Best Whip to Best Method from snowboarding. I’m so proud that he’s learning. ESPN Sport Science did a feature on the 360 frontflip, a.k.a. the “carry on”. It revealed that doing a 360 actually makes the flip easier because the multiple axes of rotation reduces your moment of inertia, which means you’re not fighting physics as much. Makes sense to me. I didn’t realize Blake Williams was out with a knee injury. Jackson Strong set the bar early on with a FIRST EVER FRONTFLIP! Then Josh Sheehan pulls a double backflip. Those Aussies are crazy (and they swept the contest)! I’m still a sucker for double grabs, especially when a rider extends the air time. I definitely had a WTF moment with Taka Higashino. He took one hand off, then goes into a double grab, and then takes both hands off to get back to the handbars all while upside down! These guys were pushing each other so hard in the beginning that the crashes got really scary. Thankfully Mark Monea got up, but Travis Pastrana thinks he’s broken his fibula and tibula. It wound up being a bunch of small fractures along his leg and ankle. Jacko’s glory run was a simple tsunami, but I still loved it because great extension is just as awesome when you’re upright. I really wonder how these guys manage to get up and still continue when they take hard slams. On the flipside, Andy MacDonald still wears pads and a helmet, and he appears to have not aged a single day since I first saw him. Perhaps safety gear is the key to longevity. Pedro Barros’ surf background really comes through; it’s like he’s gliding on concrete. Omar Hasan’s lipslide around the bowl was nuts. Too bad he fell on the transition. Practice makes perfect— or, according to Andy, it keeps you from getting lost on the park course. Rookie Raven Tershy’s key to winning seems to be both practice and determination. He never stopped pushing himself even when he was already set to win (though Pedro was behind him by a point). Congratulations to the many gold medalists of Day One: Matt Buyten (Moto-X Step-Up), Jeremy Stenberg (Moto-X Best Whip), Raven Tershy (Skateboard Park), Jackson Strong (Moto-X Big Air), and Steve McCann (BMX Big Air). Also I would like to wish the very best to Chad Kagy and Travis Pastrana, as well as everyone else who competed injured or took hard slams. Get well soon! Inspiration of the Day: Travis Pastrana proves that he is still mortal. Even though this is a sad premature end to the Pastranathon, I admire the fact that he still thinks about his sponsors, teammates, and fans and about how this is going to set back the progression of FMX. Always sacrificing himself for his sport. Question of the Day: Do you think Travis was doing to much with the Pastranathon?